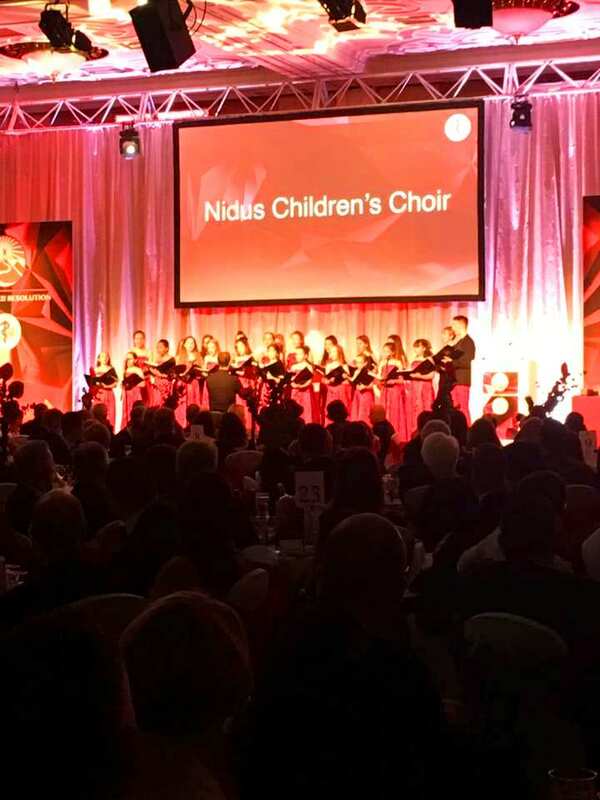 Nidus Choir Successes! all our choristers are stars!! 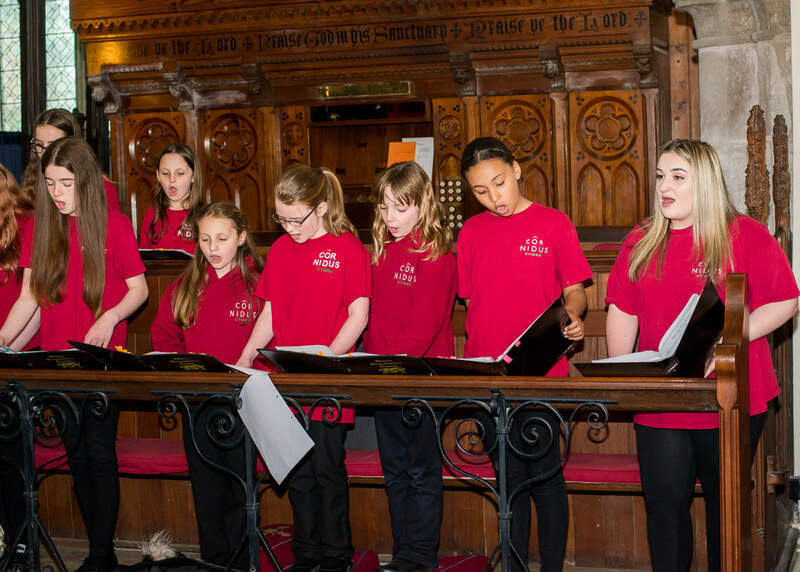 March has proved a most successful month for two of our young choristers. 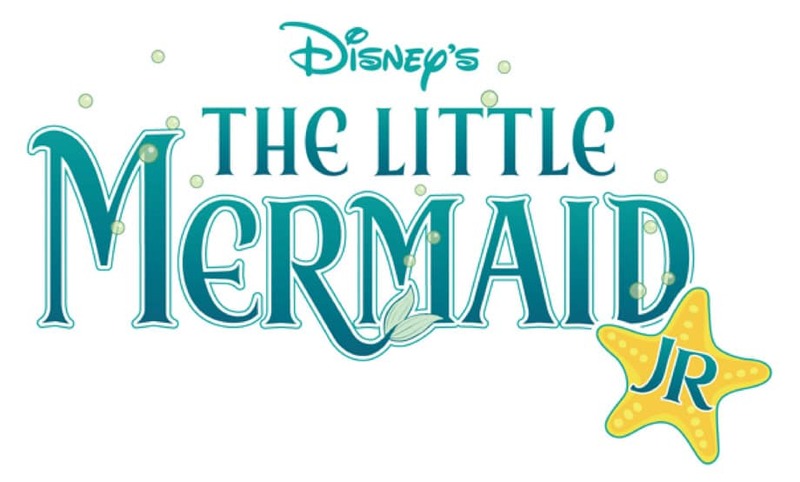 Ruby will be joining the cast of Disney's 'Little Mermaid' in Cardiff this summer. Congratulations! Emily beat ten other good singers at the Hereford Performing Arts Festival to win the gold medal for her group on Wednesday 26th March. 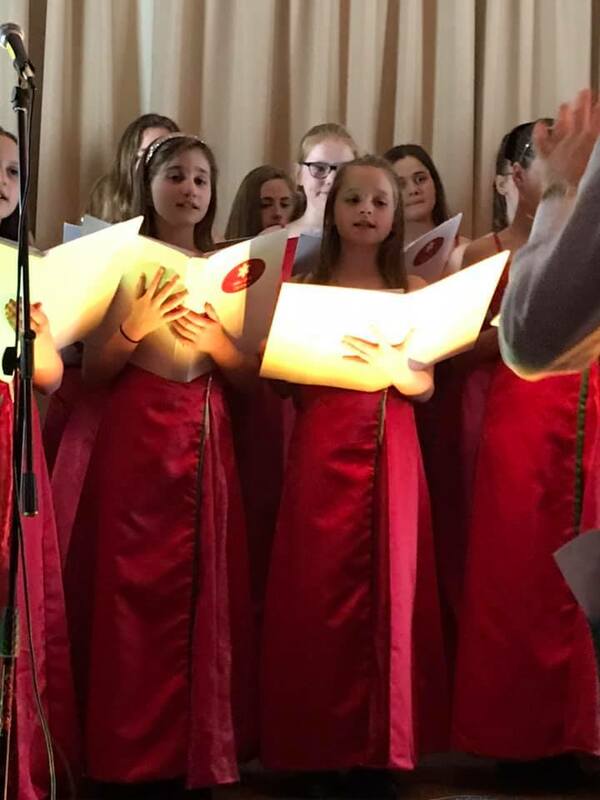 Both girls are hard workers in the choir, have lovelyvoices,reliable.disciplined-and professional (as are many of the choir !) 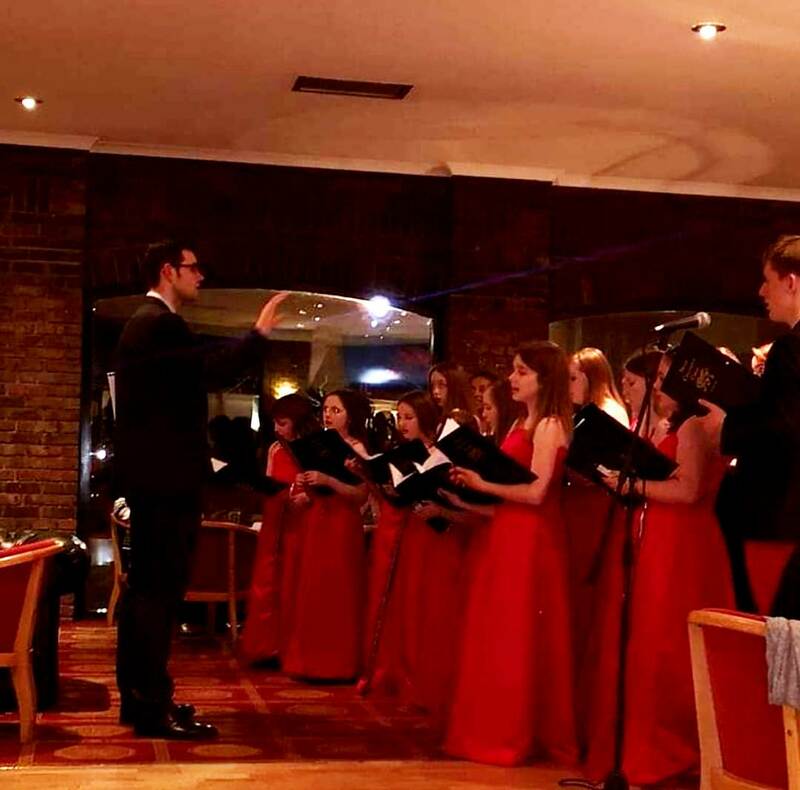 Looking forward to our next private choir function-only a couple of weeks' away! Ruby is being trained for the theatre by Nidus Theatre School, in Cwmbran. Clearly her training has stood her in good stead and together with her talent and hard work, created her success. Well done Emily and Ruby!! March 2, 2019 Happy Saint David's Day!!!!! The Parkway Hotel, Cwmbran. 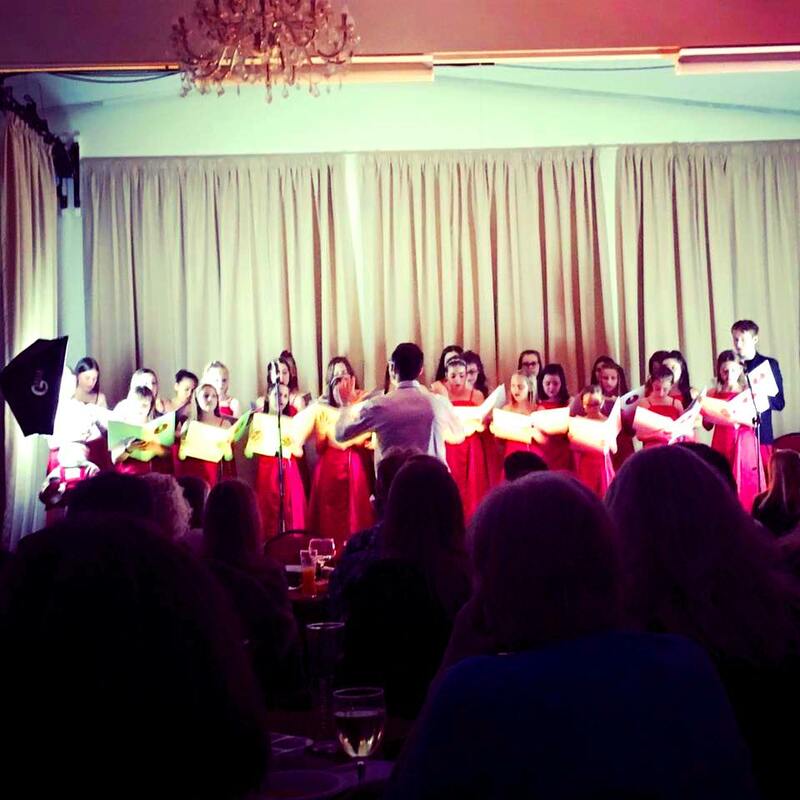 Last night, the Nidus Children's choir achieved another stunning success at the Parkway Hotel. The Programme was varied, beginning with three Welsh folk songs in Welsh from the Gwent area- Oes gafr eto, Clychau Aberdyfi (the Bells of Aberdovey) and Bugeiliad Gwenith Gwyn, beautifully sung by Rhys Nicholson. This was followed by favourites The Rose , Vois sur ton chemin from Les Cheuristes, Michael Neaum's ,Water of Tyne arrangement and Der Frohliche Wandersmann. Baritone Christian Jenkins then sang Ceriog's moving song Aros mae'r mynyddoedd Mawr, in Welsh and then Men of Harlech in English, which was enthusiastically applauded by the choir. The first part of the concert ended with two favourites with descant:The Ash Grove and David of the White Rock. Part two was shorter, began with the Irish Black Velvet Band, followed by Spanish Eyes and Mancini's Moon River and the beautiful anthem from Chess. 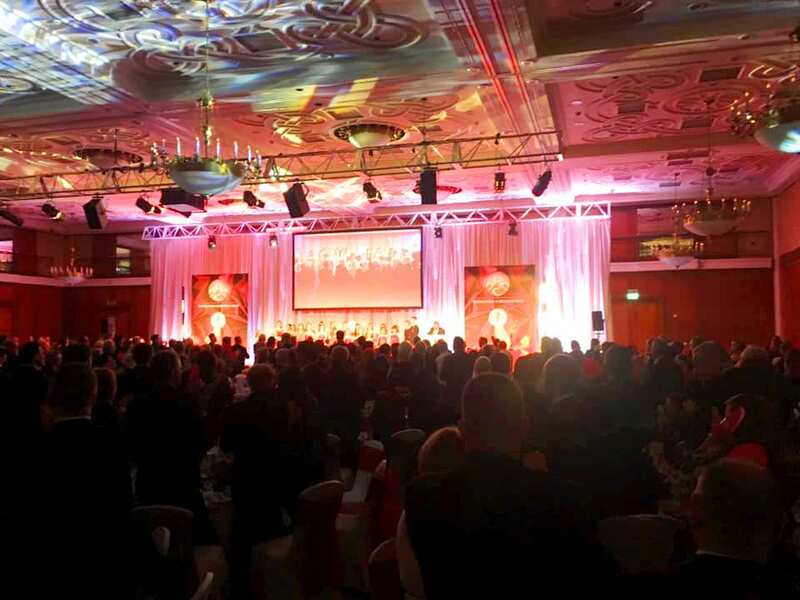 The celebration ended with the Welsh Rugby Medley, which included Cwm Rhondda, Delilah, Sospan Fach and Calon Lan. The concert finished to cheers and thunderous applause as the choir sang the Welsh national anthem and waved the Welsh and St David's flags. The feedback was excellent. 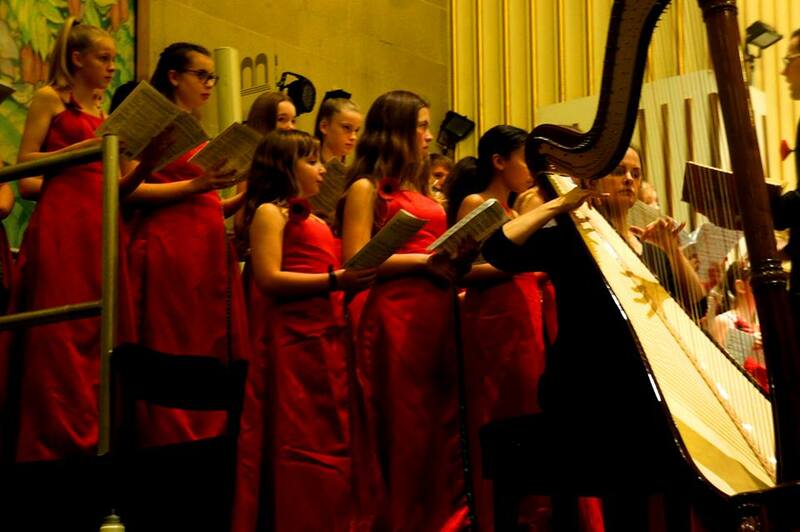 Many people commented on the sound the choir made, and the richness of the harmony. So well done all, especially choir leaders for your stirling support. 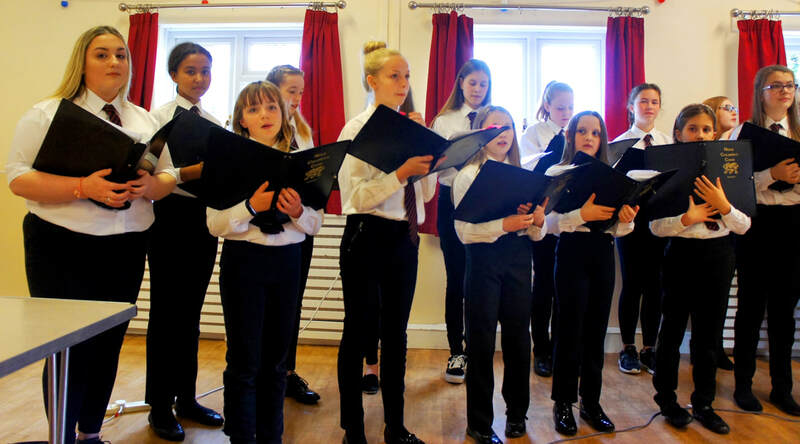 The audience were truly engrossed in the performance of the young singers. Thank you to guest conductor Christian Jenkins who sang and conducted superbly. A New Year! New Opportunities! What a roller-coaster of a year was 2018! 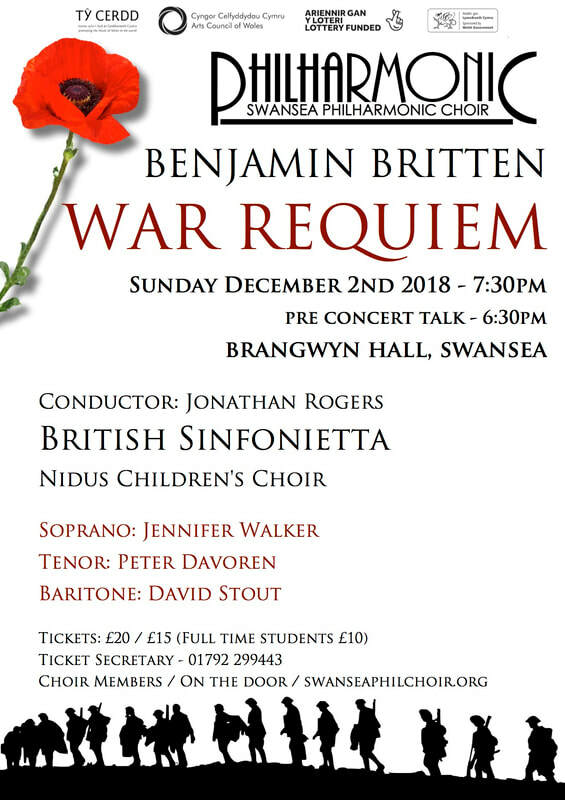 We have received marvellous feedback from the Swansea Philharmonic Choir for the performance on December 2nd of the Benjamin Britten War Requiem. The hard work put into all this made staff and parents very proud, especially Christian who conducted so expertly during the performance. 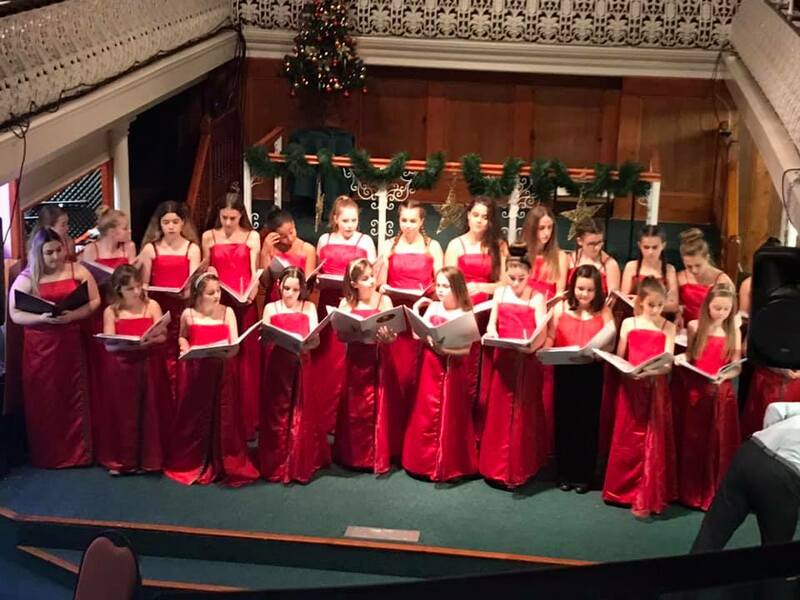 The choir are pictured above to the left in their signature red dresses. December also offered though rather at the last moment, (luckily we had kept the date free!) the opportunity to participate in the Monmouth Lanterns Parade on the 7th, and although the night was characteristically bitterly cold! Carols were sung at the Monnow bridge and Father Christmas led the procession to outside the town Hall. The choir, after contributions from a local gospel choir and some primary school children sang beautifully-just a couple of hitches with the loudspeakers inaudible at the beginning of the tracks. There was great enjoyment of the children's work and some people sang along to the final Christmas Songs, though Silent Night , Rutters Angel Carol and Joubert's Torches were very much enjoyed. Some choristers returned home immediately, others went for a meal or a look around the festive shops, but the chilliness of the night I think most did leave for warmer places. The professionalism of the choir and the lack of complaints and 'getting on with the job' was impressive. We are now sorting out our Spring repertoire and have a few places booked- The Parkway Hotel for our St David's Day Concert on March 1, 11th April Celtic Manor 6pm and another private date on May 21st in Cwmbran, but some need confirmation. We also have other opportunities, but will only take two more in the pre-Easter season as this will be plenty for us after Christmas. 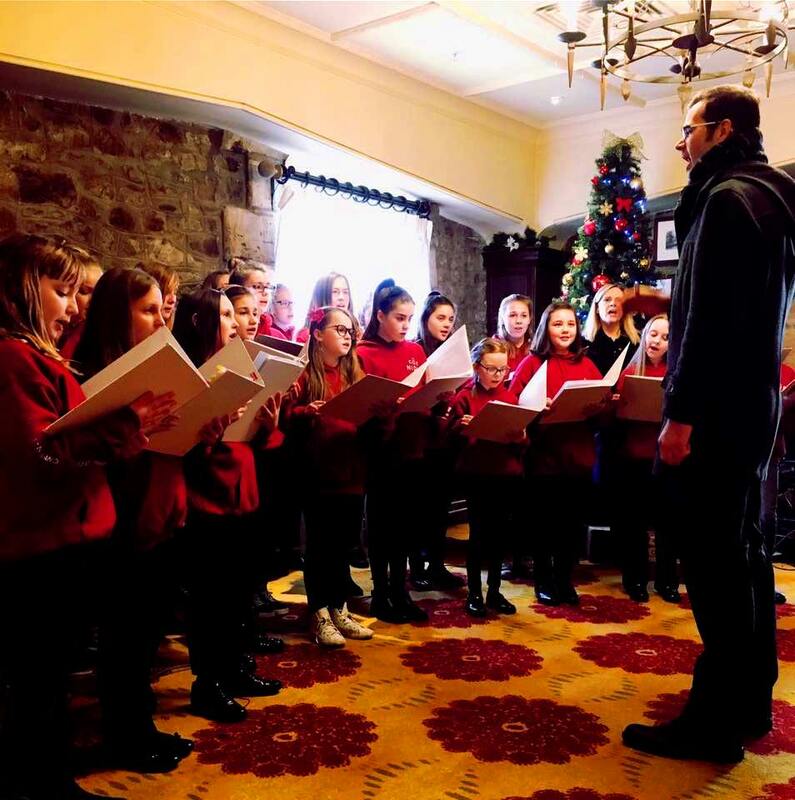 The Nidus Choir has no funding and is completely and utterly reliant on parental fundraising and we thank everyone who helped with this during the final December weeks,(and this term generally) singing and collecting money in supermarkets, Christmas shops and stores.We are also so glad for the generosity of the donors who enabled a recent cinema visit for the choir. Panteg Hospital Patients were also delighted as usual. Thank you all. BENJAMIN BRITTEN WAR REQUIEM AT THE BRANGWYN HALL, SWANSEA. December 2nd. An enormous achievement for our very young singers-our youngest is only 7 and yet they all performed superbly. There was much great feedback from the audience- most professional, excellent, wonderful singing for such young singers etc etc. This makes me, the Musical Director VERY proud. In fact the work was well sung and played by all, and the hell fires of the Dies Irae alm ost gave me palpitations! We were joined by former choristers Morgan Thomas, now in his first year at Bristol University who came to support Rhys, and Hannah Nicholson Tottle from the University of Wales. who is something of a Britten expert and kindly came to support Amelia and the Sopranosp. The conductor, Jonathan Rogers during the rehearsal, alluded to the excellent sound and tuning of the young singers. This tells me that now our new young choir are steadily reaching the standards during the last year, of our illustrious former choir. Keep working like this, and we will become an international Choir. The Nidus Christmas Extravaganza has become a much loved annual institution. Even after singing earlier in the day at Saint Pierre, they were in good voice and sang a superb concert, enthusiastically and also with great spirit. The Christmas Goose was performed humorously and the solos all excellent. The Raffle took place, and Jo Courtney and the Committee (especially Tim Walker who designed and printed the programmes) who organised and spent the afternoon setting up the tables and organising the food, which once again this year was delicious!! The Mummers' Play was much enjoyed, with the Mari Lwyd making its appearance at the end to make it all end happily. Professionals, Gabriela Nicholson-Dunbar and Nicholis Dunbar, Christian Jenkins and Georgia Nicholson-Tottle all performed their famous 'Its beginning to look a lot like Christmas,' to great enjoyment. 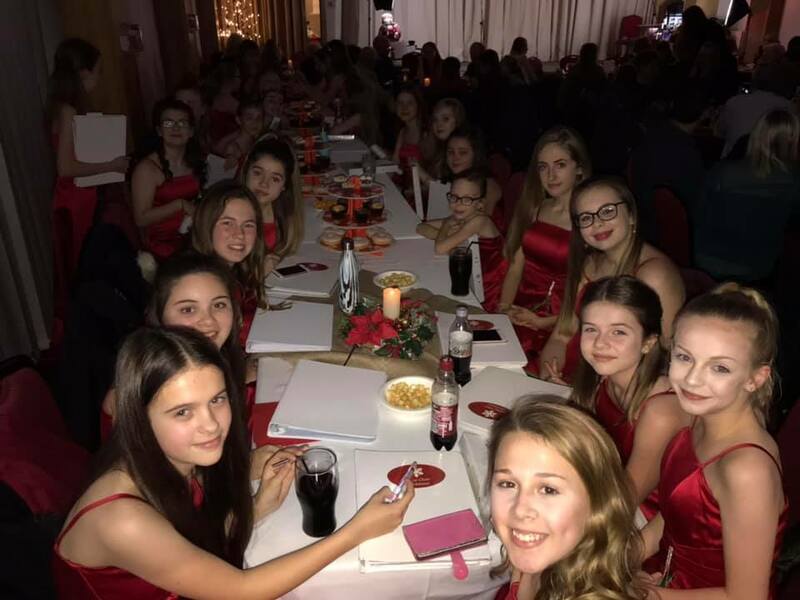 Their group will be singing again on Christmas Eve at the Parkway Hotel from 8pm. Evelyn Nicholson, the choir's Musical Director thanked everyone heartily for sll helpful actions of so many people, Jo Courtney for leading the committee in the organisation of the Extravagance and her tireless work in managing to get everyone kitted out with a dress. All the Committee, including NORMA and JACKIE for their free work every week at the Tuck Shop which sells delicious wraps and rolls as lunches for the children. The proceeds from the Tuck Shop go to our fundraising pot as well, and we sincerely thank them for their free work. A Highlight of the Christmas Season! A Party and a concert! What a great lot! 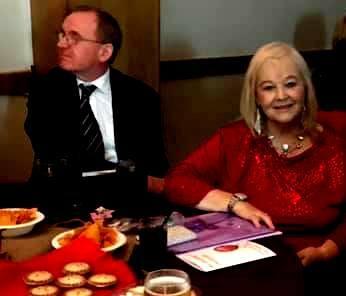 Evelyn Nicholson, the MD of Nidus Children's Choir and Ian Jenkins, her husband. Enjoying the lovely Extravaganza. Work learned, now sit back and enjoy!!! Singing in the Middle of the County. A Wonderful afternoon in the middle of the county. OCTOBER 7th. Tim Debbie and Emily really did a wonderful thing for the choir, helping with the fundraising and giving the choir the opportunity to see the lovely village, which is Devauden. Emily, her sister and Debbie seem to have cooked non stop on the Saturday and this support for the choir will help us so much. It takes money to run a choir and no staff get paid anything but expenses. The Choir sang its repertoire from earlier in the year- Water of Tyne, Singabahamba etc. 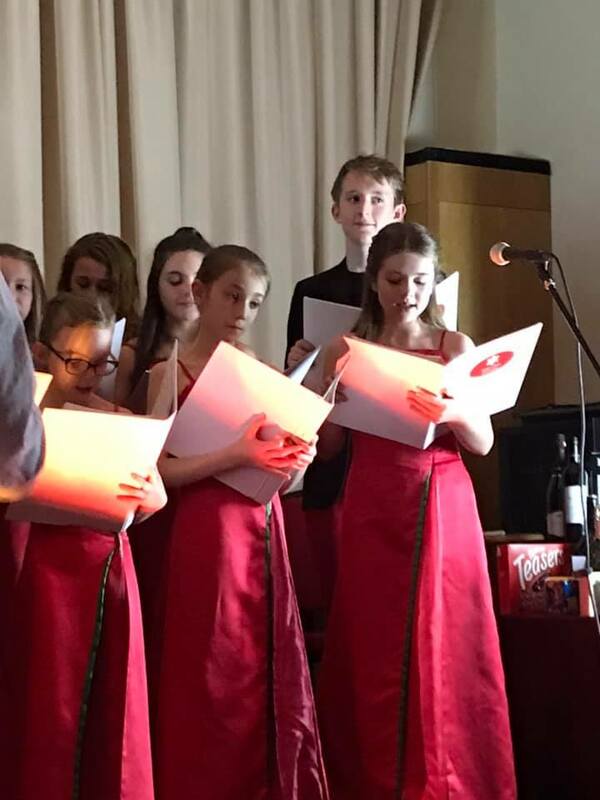 They did splendidly, again with Heidi rehearsing some of the songs, selecting backing tracks, playing them on the day, Christian coming to conduct (and taking his turn on the zip wire afterwards). Thank you to him for coming to do this. Rhys and Millie again entertained us with their Mozart duet Bei Maennern welche Liebe fuhlen. Everyone left after an excellently performed and organised concert, while Tim and his team were all putting the tables away. So grateful to the Committee and all the parents who help us raise money.Donations can be made on this web site.